In my first Thoughts on taxes post, I listed reasons why I prefer a simple and broad tax system. No matter the complexity of the income tax system, government collects about the same percent of the overall economy’s income (GDP) in taxes. Since World War II, our country has had a fairly wide variation in complexity and rates in its income tax code. Yet, the chart on this page shows individual income taxes collections have stayed in a relatively narrow range between 8% and 10% of GDP. Politicians often say they want to raise tax rates to increase tax collections. This chart suggests that rates — at least for the various tax codes since about 1950 — don’t have significant effects on government’s take of the economy as a percent of GDP. So, making moderate changes to get more (or less) revenue doesn’t seem to work. This doesn’t seem to be widely known and is rarely brought up when discussing tax rate proposals. It also doesn’t seem intuitive. It’s fair to ask, how could it be that tax rate changes don’t seem to have much effect on the total percent of income collected in taxes? Great question. I’m not sure I know the full answer, but a key part of it is that the complexity of the tax code itself. Different types and amounts of income are taxed at different rates and we all have choices that allow us at least some flexibility on how much taxes we pay. We’ll tend to favor the types and amount of income that we feel are a good deal on an after-tax basis. If the tax rate for dividend income, for example, is lower than the tax rate on capital gains (both are investment income) — then it’s worth our while to favor dividends over capital gains. Investment advisers will encourage us to switch investment strategies to invest in companies that pay dividends to help us minimize our tax bill. Management teams will respond by distributing more money back to owners through dividends than share repurchases. Consider the recent example where Great Britain raised the tax rate to 50% on those making more than a million pounds. The number of folks reporting more than a million pounds dropped in one year from 16,000 to 6,000 and taxes collected from this group declined from 13.4 billion to 6.5 billion pounds. It is thought that many of the highest earners moved abroad or reduced their taxable incomes to avoid paying the new levy. So, while the tax rate went up, the amount of income exposed to this tax rate when down meaning the weighted average tax rate in England probably didn’t change that much. There are other decisions we can make that change our tax rates. How much you donate to charity, how big of a mortgage you decide to get, deciding not to sell a stock because you won’t make enough after taxes on the gain, how much you decide to save in tax deferred retirement accounts and how much you decide to contribute to your HSA or cafeteria plan are some of the more common decisions that have clear tax implications. Raise tax rates on folks like Warren Buffett, a vocal tax increase advocate, and he’ll just donate more to charity to lower his tax rate. I’m glad others are starting to call out Warren Buffett’s hypocrisy. See here from the Weekly Standard and here from Harvard economist Greg Mankiw. Warren Buffett IS wrong on taxes (this post contains a 2003 email from me to Stephen Moore that brings up many of the same points as the Weekly Standard and Greg Mankiw linked to above). Bryan Caplan asks a great question, What Did You Learn in Business School? He goes on his post to clarify that he’s looking for things that you learned that you actually use in your career. I believe he is doing research for a book. I can’t wait to read it. We live with the mostly unchallenged general belief that all school is good and the more school the better. I think that belief is something that more of us should challenge. To answer Bryan’s question about what I learned that I use in my career, very little. Much of what I do I learned on-the-job or by researching topics on my initiative. I’ve been thinking about this question myself a lot lately. I’ve been working on a blog post with the same theme. One of the first things I credited b-school with was teaching me how to read financial statements. But, then I remember that I took an accounting class one summer while I was attending engineering school. I was interested in finance and thought that would be a good way to dip my toe into it. I took a community education course, taught by the finance manager of an auto dealership. It cost $40. We met twice a week in the classroom of a junior high school. I remember one classmate of mine was a floral designer at grocery store who was considering a career change. Later, when I took the accounting course offered in my university MBA program, which was taught by a PhD who advised state treasurers, I remember being underwhelmed with how remarkably similar it was the $40 community education course that I took. Next, I thought that maybe b-school taught me how to value business and business cases, something I do a fair amount of now. I think it laid some groundwork, but after b-school I read Robert Hagstrom’s book on Warren Buffett’s investment decisions, The Buffet Way, and was impressed with the simplicity and elegance of the valuation approach Hagstrom described. I thought it was better than what I learned in b-school, so I adopted it and have done better in that regard than many of my b-school peers who have not read the book and struggle to even express in words what exactly a stock price is. What about economics? I think a broad base in the economic way of thinking is a good tool to have a business analyst or manager. I loved micro and came as close as I could to not passing macro in my MBA program. But, neither did much for me. By the way, that was the second time I had taken both. The first time was as an undergrad. Economics was an area of emphasis (whatever that means) I remember being impressed with the “multiplier” in macro as an undergrad and I scored better there. But none of the economics courses did much for me. It wasn’t until I read Thomas Sowell’s book, Basic Economics, later that I gained a better understanding of the economic way of thinking. Since then I’ve become quite the pop economist, thanks to reading many more pop econ books, a few heavier econ books and years and years of economics blogs, along with learning exchanges in the comments sections of those blogs (sounds a lot like an online course). As I posted here, I think it would be good if b-school were to transition into more of an applied experience. Go do something. Start a business. Do a project for a business. Buy a business, try to grow it and sell it. You’ll learn a lot more valuable stuff and you will probably end up adding more value to the economy than hanging the standard sheepskin on your wall. Last summer, Warren Buffett wrote an op-ed piece supporting higher taxes on the rich to reduce the deficit. Many, including myself and Mitch McConnell, suggested that Warren put his money where his mouth is and make a voluntary contribution to the U.S. Treasury, since he thought so strongly that would help reduce the deficit. Apparently, in response to our suggestions, Buffett is offering to match any contributions made by Republicans. He’ll even match 3-to-1 anything contributed by Mitch McConnell. The only problem is, it makes no sense. Republicans, and others, who suggested that Buffett make a voluntary donation don’t believe that sending more money to Washington will reduce the deficit. To believe otherwise ignores the well established record of government spending everything we send them and then some, which is documented by our government’s accumulated national debt and annual deficits. When I suggested that Buffett make a voluntary donation, I was calling his bluff. I don’t think Buffett really believes that giving more money to the government will reduce the deficit. This would be like if I told you that I was 100% certain about the Broncos winning the Super Bowl. You ask: If you’re so sure, why don’t you place a big bet on it and make a lot of money? Me, in my best Buffett impression: I’ll match anything that you bet. You: Why would I bet anything? I’m not the one who’s 100% confident. You’re dumb! Regarding Buffett, our whole point is that if Buffett truly believed his own nonsense, he would put his money where his mouth is. In fact, he has quite an established record of putting his money where his mouth is. That’s how he made his billions, by placing BIG bets on investments that he was reasonably confident would pay off. That’s also what he has done with his philanthropy. He decided to donate his wealth to charity and to have it spent relatively quickly so that it won’t just feed generations of charity foundation bureaucrats to come. He is also trying to persuade other billionaires to voluntarily follow his philanthropic model. So, given his established record of putting his money where his mouth is, why, when it comes to supporting getting more from the wealthy individuals, is his talk so cheap? In The Wall Street Journal today, Former American Express Chairman Harvey Golub expressed his disagreement with Buffett’s desire to increase taxes on him and many others less well off than himself. Almost half of all filers pay no income taxes at all. Clearly they earn less and should pay less. But they should pay something and have a stake in our government spending their money too. It sets up a bad incentive structure when some voters pay no income tax. It costs them nothing (directly, and they may benefit directly) to vote for politicians who grow government. The bad incentive structure is illustrated well by the old cliche, it’s like two wolves and pig voting to decide what’s for dinner. Having more voters pay something for government with their hard earned dollars might cause more voters to hold politicians accountable for spending their money wisely. Golub also questions how wisely elected officials spend our money. Decades ago Milton Friedman pointed out that we spend money least carefully when we spend other peoples’ money on other people. That is government spending. Governments have an obligation to spend our tax money on programs that work. They fail at this fundamental task [because of Milton Friedman’s observation]. Do we really need dozens of retraining programs with no measure of performance or results? Do we really need to spend money on solar panels, windmills and battery-operated cars when we have ample energy supplies in this country? Do we really need all the regulations that put an estimated $2 trillion burden on our economy by raising the price of things we buy? Do we really need subsidies for domestic sugar farmers and ethanol producers? Why do we require that public projects pay above-market labor costs? Why do we spend billions on trains that no one will ride? Why do we keep post offices open in places no one lives? Why do we subsidize small airports in communities close to larger ones? Why do we pay government workers above-market rates and outlandish benefits? Do we really need an energy department or an education department at all? Before you “ask” for more tax money from me and others, raise the $2.2 trillion you already collect each year more fairly and spend it more wisely. Then you’ll need less of my money. Would Buffett want to give politicians more of his money to spend if they ran his company? Would Buffett hire this guy to run Berkshire-Hathaway? Warren Buffett makes another plea for government to take more from him and his net worth peers. First, I’ll point Buffett to my advice for those who would like to raise taxes. Thankfully, many others are calling for Buffett to lead by example and voluntarily cut a check as well. Maybe Buffett will hear that message and respond. I’ve also addressed Buffett’s analytical hypocrisy on this matter before. That didn’t seem to work. They’ve [Twelve members of Congress] been instructed to devise a plan that reduces the 10-year deficit by at least $1.5 trillion. It’s vital, however, that they achieve far more than that. Americans are rapidly losing faith in the ability of Congress to deal with our country’s fiscal problems. Only action that is immediate, real and very substantial will prevent that doubt from morphing into hopelessness. He never mentions spending — only deficit. Buffett seems unwilling to hold our elected representatives accountable for spending way beyond our means. I believe that’s partly due to an incentive effect. If it were Buffett’s own pocketbook that representatives spent from he might think otherwise. Buffett’s business, Berkshire Hathaway, is a holding company that owns lots of other companies. He grew wealthy by buying good businesses run by good managers, keeping those managers and letting them do what they do best, run their businesses. What do you think Warren would do if a business manager began spending much more than he was bringing in with no hope of closing that gap? Do you think he would beg that manager to take even more of Buffett’s money so the manager could continue his spending spree? I don’t think so either. I think he would fire him swiftly and find a replacement. 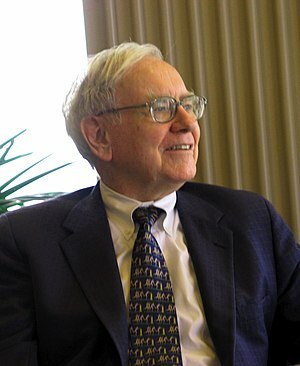 In my opinion, Buffett and his net worth peers, do much better for the economy by continuing to invest their wealth in productive ventures that make products and services that we value as consumers and provide jobs for millions of people, than by handing it over to politicians to help sustain the bureaucratic, rent-seeking behemoth we know as government. I also think Buffett and his net worth peers could do much better by explaining this to folks and encouraging us to support and vote for politicians who would like to reduce the bureaucratic drain on society and double down on productivity.